You can order CDs via post. 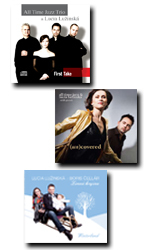 Cena CD Zimn� krajina je 14,- EUR, (Un)covered je 14,- EUR, cena CD First Take je 14,- EUR. Po�tovn� a baln� je v cene. The price of (Un)covered (CD) is EUR 14,-, the price of First Take (CD) is EUR 14,-. Vypl�te va�e kontaktn� �daje a potvr�te tla��tkom objedna�. Fill in your contact details and confirm by clicking the Order key.